Aaron Redhead could become a cult hero and a commentator’s dream if he finds his way on to an AFL club list this month. But the determined 203cm forward-ruckman is much more than just his name and matching hair colour. Redhead has gone from complete unknown playing for the Killarney Vale Bombers on the NSW Central Coast to potential draft bolter in just 12 months. The 19-year-old has surprised even himself with his rapid progression since packing his bags and moving to Perth by himself at the end of last year to pursue his football dreams. Redhead always had the football bug while living in NSW, but his career was going nowhere. He moved in with his grandparents in Perth and joined the East Perth colts, where his talent didn’t go unnoticed. 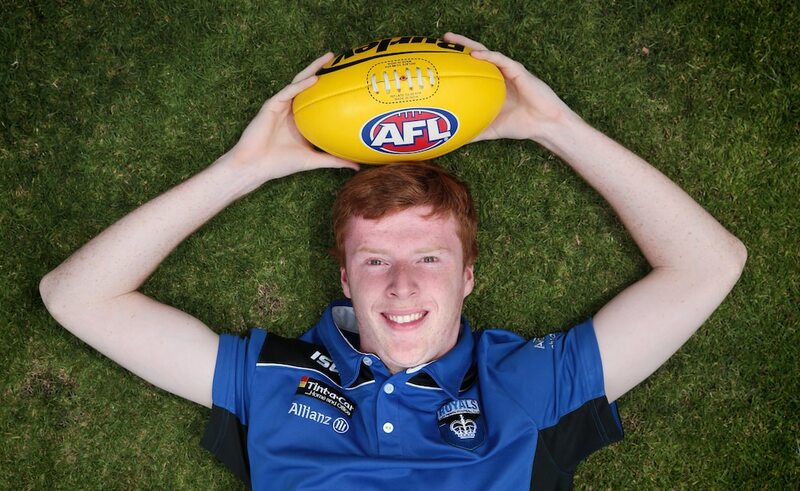 Redhead made the WA under-18s squad and played in the win over Vic Country at Etihad Stadium. “Coming from country footy in NSW and then coming over and in one year playing in Melbourne and getting coached by AFL coaches and talking to AFL clubs, it’s been awesome,” he said. Six clubs have interviewed Redhead and his stocks soared again after his performance at the State Draft Combine last month. Redhead defied his size to record a 7.91sec. agility test and 2.94sec. in the 20m sprint — both personal bests. He is determined to add bulk to his frame over summer without losing any of his athleticism. His colts coach Adam Pickering said Redhead was a freak athlete who would be the ideal rookie selection. “He did most of the pre-season with the league boys but would be in the top five or 10 per cent in all the endurance stuff,” Pickering said. “On game day we saw glimpses of that agility and speed. Sometimes he’d pick the ball up and look at midfielders and burst away. It was pretty remarkable for a boy of that size. As for constant ribbing about his name, Redhead has never had a problem.